Considering that what passes for an idea around here is doing two days about vampires and then two days about zombies, it’s necessary for me to every so often indulge in a kind of palate cleanser. I do not want this October to progress into two days about wolfmans and then two days about Frankensteins and then two days about weremummies, and so on until we’re all curled up on the kitchen floor, probably dead. The standard horror tropes and subgenres and monsters can be wonderful and entertaining, stories based around them can be brilliant, but unless you hit some kind of freakish lucky streak in your reading, they can also very quickly become to-your-bones wearying. Fortunately, in my preparations for this project every year, I tend to overspend, and as a result I have a mountain of brand new horror anthologies – and old ones, too -- into which I plan to dive. 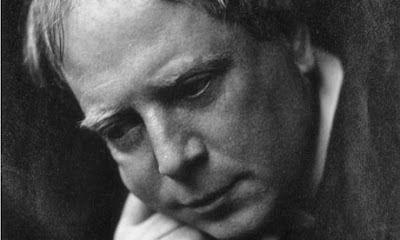 But before I do that, I feel the need to make an abrupt tonal shift away from the last four days, and read something I had every reason to believe would be superb: Arthur Machen’s “The White People”. Just before dinner, in need of a break, read a story by Arthur Machen. Welsh writer, turn of the century, though think the story's set somewhere in England: old house in the hills, dark woods with secret paths and hidden streams. God, what an experience! I was a little confused by the framing device and all its high-flown talk of "cosmic evil," but the sections from the young girl's notebook were...staggering. That air of paganism, the malevolent little faces peeping from the shadows, and those rites she can't dare talk about...It's called "The White People," and it must be the most presuasive horror tale ever written. The reason for my shame, as I mentioned in passing in the Klein post, is that for all my supposed love of horror fiction, I had not, at that time, read "The White People" or very much Machen at all. After yesterday, I have now read two whole stories by him. So where, exactly, do I get off bitching about the shoddiness of so much in the genre if I'm not even reading all that much of the really good stuff? It's not like it's not up there on my bookshelves. This is a danger, for me anyway, with a project like this. Every year, between Octobers, I might consider reading something like "The White People" only to decide "Ah, I'll save it for the project." And I will in fact do that, but in the year between The Kind of Face You Slashes, my knowledge of the genre will not have increased too terribly much. It's like I've gotten to the point where I almost consider reading horror fiction off-season as a busman's holiday, and as Mr. Burns once said "That shouldn't be." "There is, no doubt, an analogy between [true evil and that which we call evil]; a resemblance such as enables us to use, quite legitimately, such terms as the 'foot of the mountain' and the 'leg of the table.' And, sometimes, of course, the two speak, as it were, in the same language. The rough miner, or 'puddler,' the untrained, undeveloped 'tiger-man', heated by a quart or two above his usual measure, comes home and kicks his irritating and injudicious wife to death. He is a murderer. And Gilles de Raiz was a murderer. But you see the gulf that separates the two? The 'word,' if I may so speak, is accidentally the same in each case, but the 'meaning' is utterly different. It is falgrant 'Hobson Jobson' to confuse the two, or rather, it is as if one supposed that Juggernaut and the Argonauts had something to do etymologically with one another. And no doubt the same weak likeness, or analogy, runs between all the 'social' sins and the real spiritual sings, and in some cases, perhaps, the lesser may be the 'schoolmasters' to lead one on to the greater..."
First of all, obviously I need to start dropping "flagrant 'Hobson Jobson'" into my everyday speech, but second you must understand that Ambrose is not merely saying that what we consider evil is the killing of one person, while true evil is the killing of several -- de Raiz was (allegedly!) a mass murderer, but he was also (allegedly!) someone who did more than dabble in the Occult, and according to Ambrose true sin is an attempt to achieve saintliness -- and not necessarily of the Christian variety, but of the otherworldly and spiritual anyway -- through occult methods. Evil "is the infernal miracle as holiness is the supernal," he says. ...I sat quite still and watched, and out of the water and out of the wood came two wonderful white people, and they began to play and dance and sing. They were a kind of creamy white like the old ivory figure in the drawing-room...They played together, and danced round and round the pool, and they sang a song till I fell asleep. Nurse woke me up when she came back, and she was looking something like the lady had looked, so I told her all about it, and asked her why she looked like that. At first she cried, and then she looked very frightened, and turned quite pale. Portions of "The White People" take on the form of a child telling a tale, transtioning almost every event and thought with "and" or "then", and in fact that is what much of "The White People" actually is, but instead of wonder or beauty and thrilling adventure, and despite the girl often referring to things as "wonderful" and "beautiful", somehow we know that enormous, unknowable evil, evil as a root of existence, like water or the human mind, is the thread that connects everything. This is what the opening conversation between Ambrose and Cotgrave accomplishes, among other things -- it somehow makes what follows horrible, instead of merely curious, with hints of interesting shadows. It makes the fairy world terrifying almost by simply stating up front that the reader should find it so. The epilogue to "The White People" finds Ambrose and Cotgrave together again, the latter returning the book, and we learn more about the girl's life subsequent to what is recounted in the book. I won't say what, although there is some level of safe assumption involved here, but the kicker is an ambiguous phrase Ambrose uses to describe the girl's current known status that is really compelling and insinuating and more than likely awful, if we knew what she knew, which we don't, and thank God for that. Terrific post! Your level of knowledge and thoughtfulness really comes through, and makes me want to go read the story. I've read a lot of horror fiction, particularly the more literary sort, and as I get older I've been enjoying the work of the acknowledged masters such as Machen more than I did when I was younger. I enjoy your October writing because no one else that I know of writes about this genre with such seriousness and respect. Kudos! Thank you very much, Taidan, that means a lot to me. And you should rush right out and read "The White People", as well as Machen's "The Great God Pan", if you haven't already.